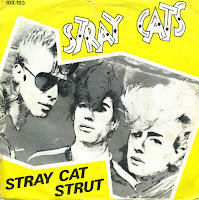 'Stray cat strut' is a track on the Stray Cats' debut album, released in 1981 in the UK. Released as the third single from that album, it reached number 13 in the Dutch Top 40 and number 11 in the UK singles chart. In 1982, the song became a hit in the US, peaking at number 3 in the Billboard Hot 100. Brian Setzer later played this song with his new band, The Brian Setzer Orchestra. The Stray Cats formed in 1980 in New York. Brian Setzer, Lee Rocker and Slim Jim Phantom based their style upon the sounds of Sun Records artists and other artists from the Fifties. When they heard rumor that there was a revival of the Fifties Teddy Boy youth subculture in England, the band moved to the UK. In the summer of 1980 the cats found themselves being courted by the elite of the music world including Virgin Records, Stiff Records and Arista records. Word quickly spread and soon members of the Rolling Stones, The Who and Led Zeppelin were at their shows. Dave Edmunds offered to work with the group, and they recorded their debut album, which was released in early 1981. 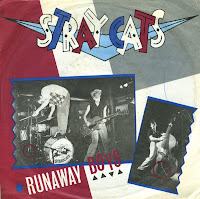 Ahead of the album, their first hit single 'Runaway boys' was released. It reached number 3 in the Dutch Top 40 and number 9 in the UK singles chart.